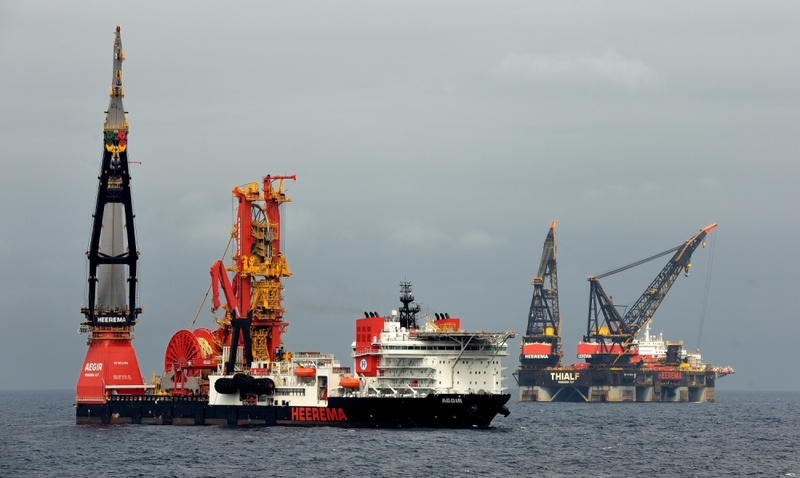 Anadarko awarded Heerema Marine Contractors the contract for the T&I of Suctions Piles, Spar Hull, Moorings, Topside and Modules for the Lucius Development. Besides the installation of the Spar facility HMC was also responsible for the Engineering, Procurement, Construction, transport and Installations of the subsea structures and pipelines for the Spar-based field development. The Lucius Development is located approximately 275 miles southwest of Fourchon, Louisiana in Keathley Canyon blocks 874 and 875. The Lucius project comprised of an area development in which several subsea wells are tied back to a single Truss Spar facility. Oil and Gas production was exported from the facility through Steel Catenary Risers (SCRs). The Lucius Development consists of a Truss Spar Hull, moored with a nine(9) leg taut mooring system and carrying a processing facility. The Spar was installed in a water depth varying from 6800 to 7400 ft. PHASE 3: Remove 941 ShT Temporary Work Deck, T&I of a 10250 ShT deck, 825 ShT Living Quarters, 500 ShT & 700 ShT Booster Compression Modules, 54 ShT Stair tower, 132 ShT flareboom, 90 ShT Platform crane plus kingpost and walkway. PHASE 4: Replacement of a damaged segment of a mooring line. The line was not damaged by HMC, only replaced.